And because we think a week isn&apos;t long enough to explore all the great dining options in Sonoma Valley, the "week" is actually ten days, running from March 1 to March 10, giving diners the chance to try out multiple restaurants and cafes along the 17-mile Sonoma Valley. How it works: Throughout restaurant week, visitors and locals will enjoy prix fixe menus at the area’s participating restaurants. Prices for lunch are $10 and $15, while dinner prices are $19, $29 or $39, depending on the restaurant&apos;s prix-fixe menu. Mary’s Pizza Shack: The menu includes an appetizer course, featuring Mary’s signature salad, Caesar salad or soup; an entrée course, featuring spaghetti with meatballs, bowties in lemon cream sauce or bambino pizza; and a choice of spumoni bomba or chocolate and vanilla bomba for dessert. the fig cafe & winebar: The menu starts with roasted beet salad, followed by roasted pork loin, served with farro, Brussel sprouts and bacon vinaigrette. A chocolate budino with vanilla Chantilly and cinnamon pecans is served for dessert. HopMonk Tavern: The three-course meal starts with crispy fried pear onions or mixed green salad with blood oranges, followed by a main dish, with offerings including linguini chicken carbonara or Cajun catfish sandwich. Complete the meal with iced orange cake or rum vanilla flan. 38 Degrees North: The menu includes an appetizer course, featuring kale Caesar salad or crispy Brussel sprouts; an entrée course, featuring a dry-aged burger, turkey reuben or grilled cheese with tomato soup; and a choice of crème brulee or salted butterscotch pudding for dessert. Carneros Bistro & Wine Bar: The three-course menu includes choice of tortilla soup or kale and quinoa salad; choice of roasted organic half chicken or mushroom Bolognese; and s’mores or local cheese plate. Della Santina’s: The three-course meal starts with tonnato di maiale, thinly slice pork loin topped with a tuna caper sauce, followed by risotto ai porcini. For dessert, enjoy double layer Callebaut chocolate mousse tart. the girl & the fig: The three-course meal starts with a crispy Brussel sprout and kale salad, followed by a main dish of duck sugo, served with baby vegetables and creamy polenta. A butterscotch panna cotta with chocolate croutons, Italian meringue and candied cocoa nibs is served for dessert. Glen Ellen Star: The menu includes an appetizer course, featuring a simple green salad, chicken noodle soup or a mixed chicories salad; an entrée course, featuring house made rigatoni with artichokes and brick chicken with red flint polenta; and house made ice cream for dessert. Salt & Stone: The three-course menu includes an appetizer, including soup of the day, French onion soup, Salt & Stone Caesar or winter chicory salad; an entrée, including crispy salmon skin, braised lamb shank or local free-range chicken; and finishes with chocolate mousse or tres leches cake. Additional Sonoma Valley restaurants participating as part of Sonoma County Restaurant Week include Picazo, a locals favorite for burgers and their outdoor patio, and The Red Grape, right off the historic Sonoma Plaza and famed for their pizza and pastas. 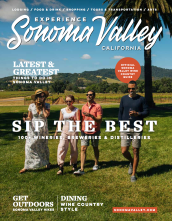 If you miss your chance (hey- we gave you ten days) then don&apos;t worry - you can still find great places to eat or drink in Sonoma Valley in our dining section. But you should stop reading and start eating - it&apos;s Sonoma County Restaurant Week!